May 14, 2013 By This post may contain affiliate links. Looking for a great dessert for your child’s graduation party? 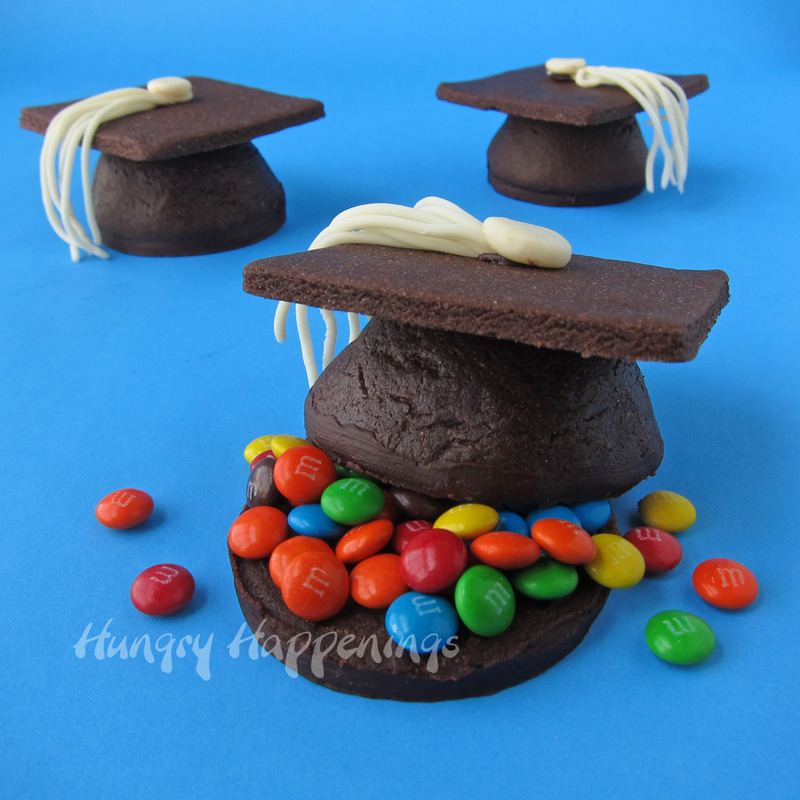 These Candy Filled Chocolate Graduation Cap Cookies are an amazing way to wow everyone! Graduation season is upon us, and so many of my friends, family and customers have children who are graduating this year. I’ll be busy making desserts and chocolates for many parties in the next few weeks and had a request for graduation cap cookies.I’m pretty sure my customer expected me to make royal icing covered cookies, but being I don’t have the patience or skill to pipe royal icing onto cookies, I opted instead to craft 3D graduation cap cookies filled with candy. My experimentation with the recipe was quick and easy, I got the result I had hoped for in my first attempt. That doesn’t always happen, so I was thrilled. My customer was even more excited when I sent her a picture of the cookies. Pinata type cookies are extremely fun to create and even more enjoyable to eat. Being my first batch of these graduation cap cookies were made weeks before the party, and I didn’t figure they’d freeze well, we just ate them. I packed a few of the cookies for us to enjoy during our long flight to Mexico last week and got a kick out of watching how the woman sitting next to my husband reacted as he poured candy out of the cookie and into his mouth. She was intrigued and excited by the whole candy filled cookie concept, as I’m sure most people will be. I look forward to seeing how people react to them at the upcoming graduation parties. 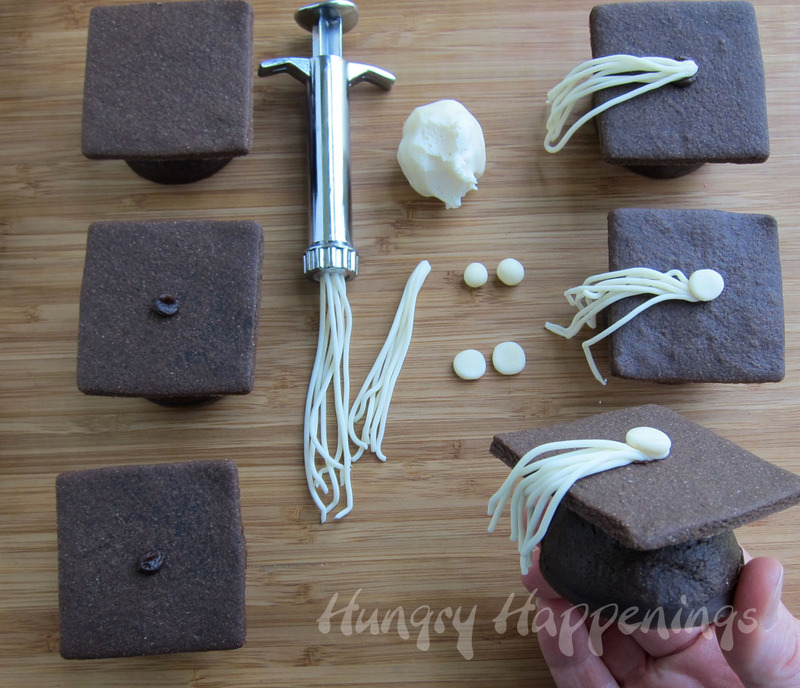 NOTE: I opted to make traditional black graduation caps using chocolate cookie dough, but if you prefer, you could create your caps in school colors. 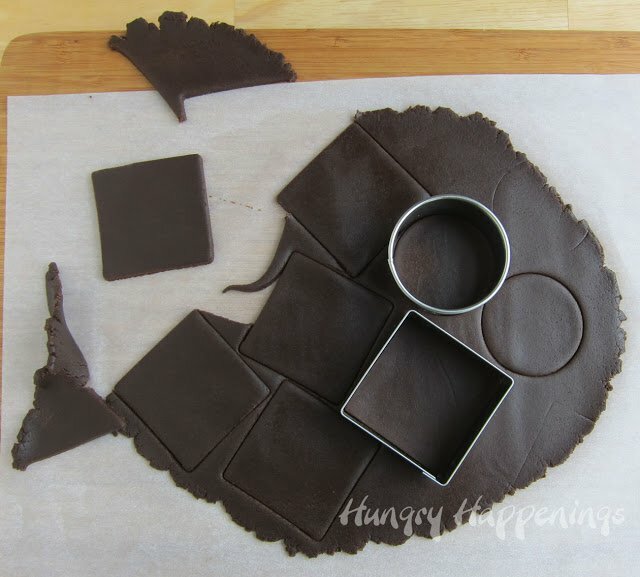 Just make a plain cut-out cookie recipe and add color to the dough. You can color the modeling chocolate tassels, as well. In a large mixing bowl, combine butter and sugar. Cream until light and fluffy. Mix in eggs and vanilla. Combine cocoa powder, baking powder, and salt in a small bowl. Stir in to wet ingredients. Add flour and mix just until incorporated. Roll out the dough in between two sheets of parchment paper. You’ll want the dough to be about 1/8th of an inch thick. Cut out twelve 2 1/4 inch circles and twelve 2 1/2 inch squares, re-rolling dough as needed. Place on a baking sheet lined with parchment paper and bake for 8-10 minutes. Allow to cool completely. Roll out remaining dough and cut twelve more circles. Cut a pie piece out of each circle of dough. Turn mini muffin tin upside down. Set a round of dough over a muffin cup, press it down, wrapping it around the cup. Cut off any excess dough at the cut and press the seam together. Repeat, creating a total of 12 cookie cups. 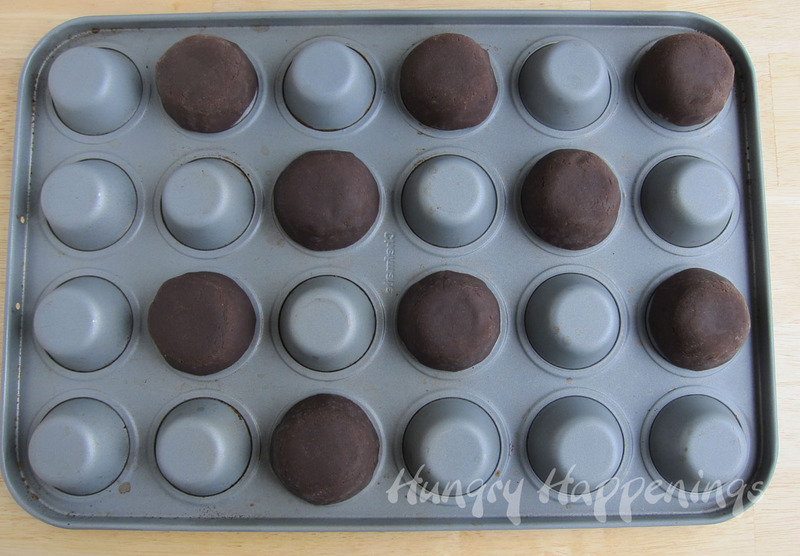 Freeze cookie cups for 15 minutes, to ensure they will hold their shape well. Bake for 8-10 minutes. 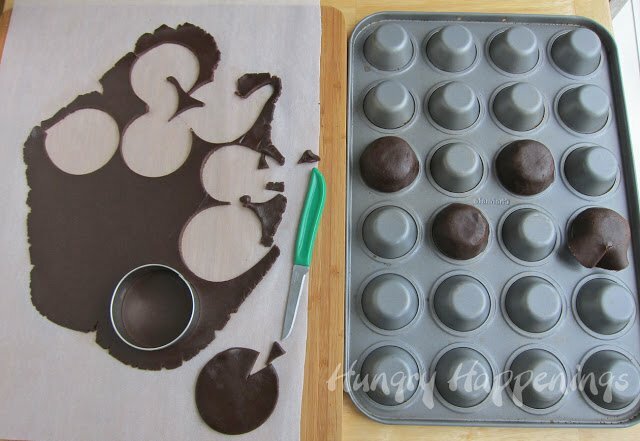 As soon as you remove the cookie cups from the oven, press down on the top of the cookie cups to create a flat top. Allow cookies to cool completely, then pull up on them and remove them from the muffin tin. Assemble the chocolate cookie graduation cups. 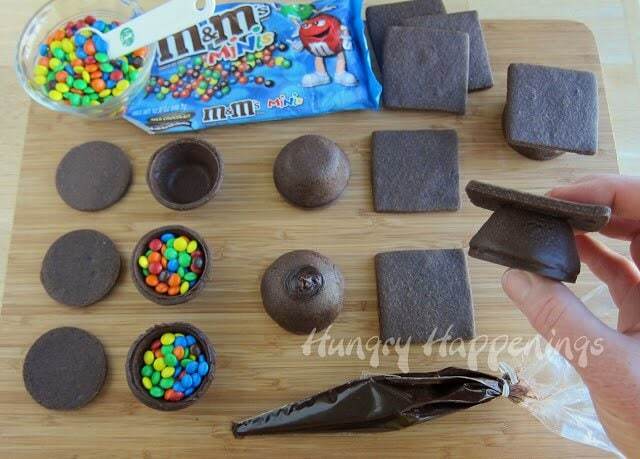 Fill cookie cups with candies. Pipe a thin line of chocolate frosting around the edge of the cup. Press one round cookie onto the cookie cup and set it on the counter, flat cookie side down. Pipe a small amount of chocolate frosting on the top of the cookie cup. Press one chocolate cookie square on top, creating the shape of a graduation cap. Allow to dry for at least 15 minutes so that all the pieces stay together. 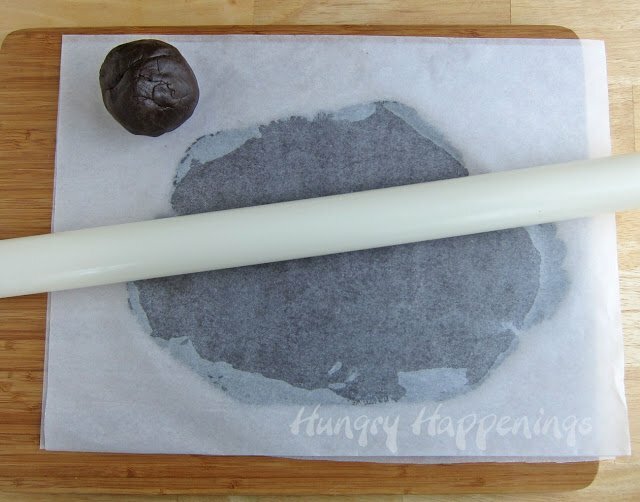 Knead a small amount of white modeling chocolate and roll it into a thin log. Insert the log into a clay extruder fitted with a multi hole plate. Press the modeling chocolate through the extruder, creating tassels. Cut the tassels about 1 1/2 inches long. You can also use a new garlic press or just roll very thin logs of the modeling chocolate by hand. 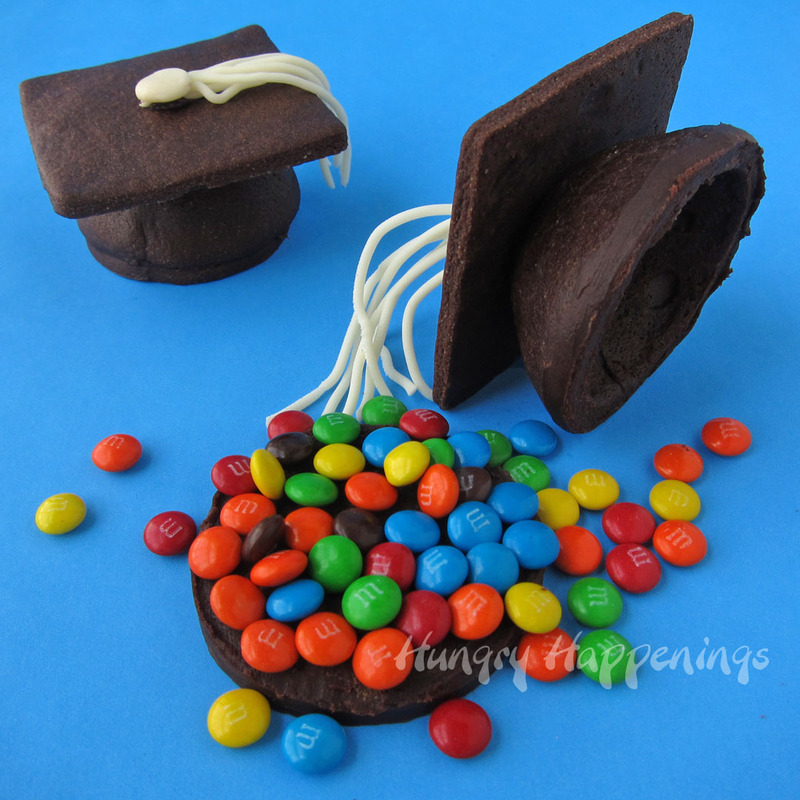 Pipe a small dab of chocolate frosting in the center of the square cookie on your graduation cap. Press the tassels onto the frosting. Pinch off a pee size piece of modeling chocolate, roll it into a ball, flatten it into a disc and press it down onto the center of the cookie on top of the tassels. Store in an airtight container for up for up to a week. Each cookie can be served as dessert or wrapped in cellophane bags and used as party favors or graduation gifts. Previous Post: « Strawberries and Cream Berry Baskets for “berry” special people. Very clever – as always. Have seen lots of graduation caps on the internet, but none with candy inside. My 1st thought was to put a note by the cookie tray advising people there's a surprise inside so people know to turn them up-side-down when eating them (to avoid spillage of the M&M's). Coloring them in school colors, as you suggested, is a great idea to personalize them. Don't have a graduate – no problem. Your instructions for the cap can be used for other holidays as well. Easter would be good – it can be sitting at the feet of a bunny rabbit and filled with jelly beans. Or it can be filled with edible grass or colored coconut…..add a small bird. Or…use it as a Pot of Gold on St. Patty's Day, etc. etc. I have really had fun making pinata style cookies filled with candies. I am sure you will see many more here in the future. I recently even made a pinata cake which I'll be sharing soon. Its a shame no one has any original ideas anymore. Someone makes a candy filled pinata cookie and now EVERY cookie is a version of that . I am of a different opinion. I think about it this way, one person created the first cake, now there are hundreds of different recipes. Someone used fondant for the first time to cover a cake, now there are millions of amazingly decorated cakes. A buckeye (peanut butter fudge ball) stuffed inside a Pillsbury Cookie won a million dollars in the Pillsbury Bake Off – was she the first person to stuff a cookie, I doubt it, but the judges felt her twist on the idea was worthy of the grand prize. I personally love the idea of adding candy inside cookies, cakes, and chocolates and will continue to create new concepts based on that first candy filled treat. I feel my blog is filled with original and creative ideas and hope you take time to look around my Recipes Page to see all the fun food I've created. I live in a part of the world where pinata cookies are still an original idea. I have never once seen them at parties or anywhere else. I love this idea for graduation! I'm a teacher and this would be such a cute gift to give seniors on their last day! You are a cool teacher to even think about giving a gift to the seniors. I'm sure they'd love it!!!! Adorable! Love the idea of using the mini muffin tins. You are brilliant my friend! SO AWESOME! I love these Beth! …and this is coming from the original Piñata Cookie Lady. (Maybe "anonymous" above needs some cookies to go with her sour milk.) I totally agree with you. We share our creative ideas and actually hope and encourage others to take it to the next level. I never would have thought to do this in a million years. I love your twist on putting a surprise inside of a dessert. Thanks for sharing and creating. You are fabulous. Thanks so much for your support, Sandra:) I feel those of us who are blogging about edible crafts and artistic food are pushing each other to create even more amazing projects and I feel it's impossible not to take a great idea and change it up a bit adding our own unique twist to it. Other bloggers ideas fuels my creativity and you certainly have inspired me beyond belief! I love this idea! Pinning for my husband's graduation next year! Beth Sooooo cute!!! fantastic idea now that graduations are coming!! I love your blog, the projects that you make are brilliant. I use to make a lot of cakes, cupcakes, etc., but cookies uffff its something that I always have a great excuse for not do it, but when I see something so cute as this one I change my mind. I will give a try….Congratulations!! Thank you so much for your kind words. I love baking just about anything, but don't often ice decorations onto cookies. I love that these are so decorated, yet I didn't have to pipe on any royal icing. They were pretty easy to make. I do hope you give them a try! Best graduation cookies ever Beth! SO-MUCH-FUN! I love ALL your graduation treats! I've pinned them ALL 🙂 Thanks so much for sharing at Two Cup Tuesday on Pint Sized Baker. Thanks for the pins! I'm glad you like all the ideas. Wow thats looks great. I am just wondering how they taste? a lot like buttercream I guess. Might be a little too sweet. Do you have any ideas on a more light version of this? Thanks for the idea and the recipe. Thanks, Merve. Actually the chocolate cookie has a pretty strong cocoa flavor and isn't terribly sweet. You could fill them with anything you'd like. Peanuts could balance out the sweetness. Of course, that doesn't make it lighter. I don't really have a suggestion to make them lighter, other than find a healthier cut out cookie recipe and use it. I tried this and i am honestly so disappointed. The cookie mixture once I finished was too runny to roll, so I had to add more flour and cocoa powder one tiny tea spoon at a time. I made the squares and circles easily, but when it came to the cups it just started cracking. When I tasted the cookies that I had cooked (the squares and circles) they were disgusting! Then, after pulling the cups out, they cracked completely which is what I was expecting. I am left out of pocket and with nothing to give my brother when he comes home from his graduation tomorrow! I am so sorry to hear that your cookies didn't turn out. 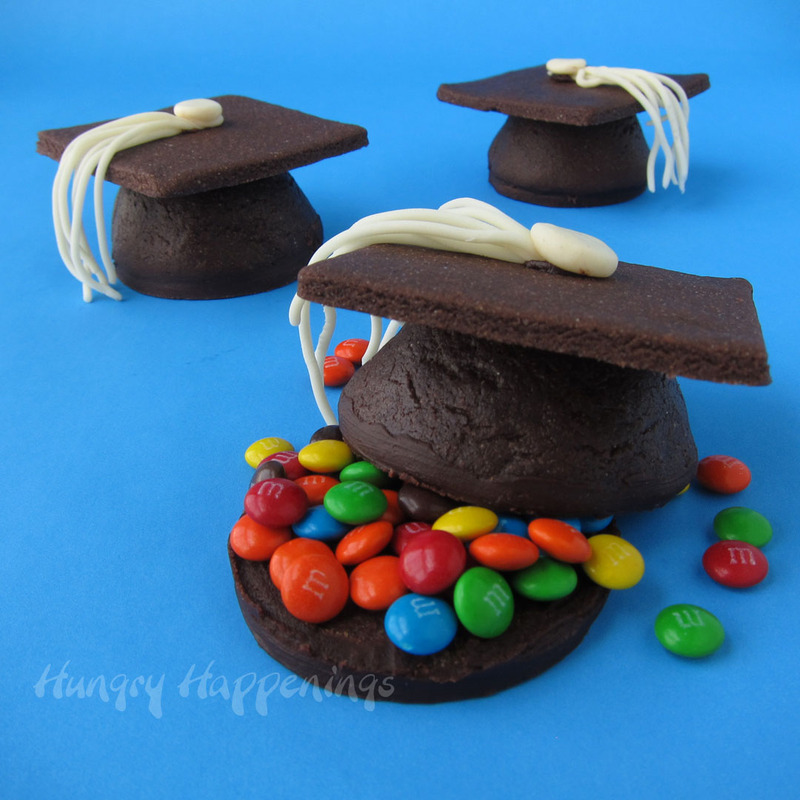 I've used this chocolate cookie recipe, which was only slightly adapted from LilaLoa's recipe, to make these graduation cap cookies three times and each time they tasted great and had a nice consistency. Unfortunately there are factors that can effect the outcome of a cookie recipe and not being there with you, I have no way to tell you what might have gone wrong. I wish I could have been with you in order to help. Super cute idea. I did make the cookies and there were….ok. A very strong cocoa flaver and very crispy, although they have actually softened in the last day or two. I'm going to try again with a chocolate sugar cookie recipie. The cookies would be very good as for ice cream sandwhichs though. I needed to use a chocolate cookie that didn't spread and this one from Lila Loa is great in that respect. I really like the flavor, but she does use this recipe for her decorated cookies so she adds a sweet royal icing on top of them. If you use a sugar cookie recipe, just be sure it isn't one that will spread a lot.